This beautiful office center in Ridgefield's business district boasts various office sizes ranging from $375 per month to $950 per month. Utilities included. There are nine individually leased offices with a common entryway and kitchen, newly finished and professionally decorated. 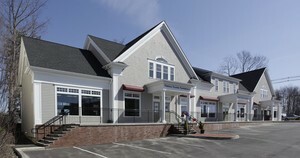 The office center is close to shops, restaurants and services - a prime location facing Danbury Road part of the Copps Hill Marketplace. There is excellent parking, WIFI, utilities, shared kitchen, and there is a professionally decorated waiting area.